Four 20-watt halogen lights illuminate displayed items! 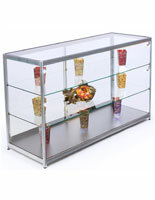 Extra-vision design allows the maximum viewing area for your products! Counter-height showcase provides a tabletop display area, as well! 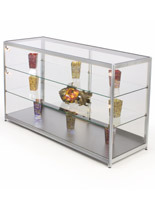 This store showcase is a quality retail display showcase for many types of commercial environments. 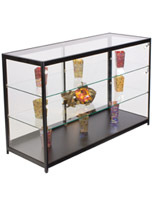 The display case, store showcase is ideal for displaying jewelry, watches, delicate glass items, eyewear, makeup, comic books, handbags and much, much more! 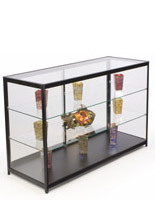 This store showcase can be seen anywhere from a museum to a jewelry store, department store, movie theater, hospital, Hall of Fame, and much more! This 'Essentials Line' store showcase offers businesses all the conveniences of a high-end showcase, without an exorbitant price tag! 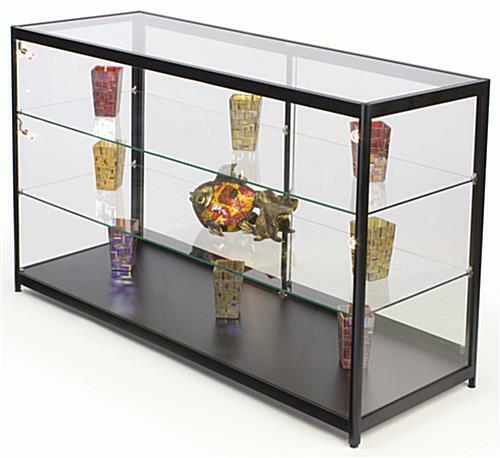 This store showcase, also known as a retail display case, features a simple, streamlined construction, so the focus remains on items inside the showcase, not the showcase itself. 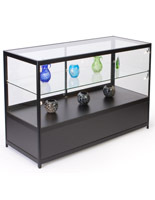 Black aluminum extrusions provide a sturdy frame to hold full tempered glass panels. 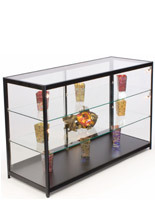 This tempered glass construction offers a safer alternative to traditional annealed glass showcases. 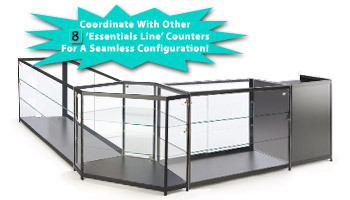 Useful features of this Essentials Line retail store showcase include: floor levelers, four 20-watt halogen lights, sliding rear doors for easy access to jewelry or other products, a plunger security lock (located just inside sliding doors), & height-adjustable shelves. 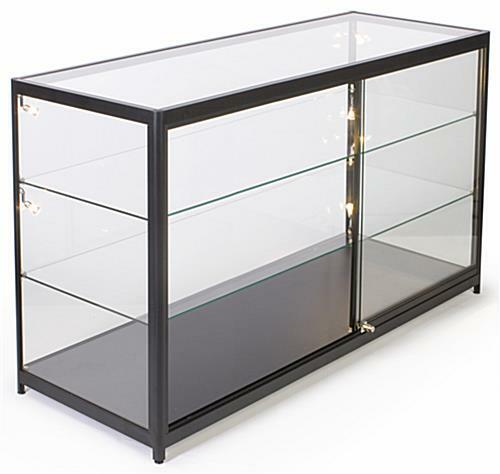 Counter-height store fixtures serve double duty; not only to they display merchandise inside, but the top of this store showcase can be used to hold countertop cases or merchandise. 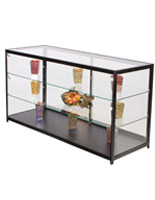 These glass store fixtures are perfect for a department store, jewelry store and much more! Showcase ships fully assembled. 72.0" x 38.0" x 23.8"
We are using these for trading card displays and as a front counter. They work quite well in this way and seem fairly sturdy now that they are in place. We had some complications around shipping that left some inconvenience, but Displays2Go did replace our broken unit when reported.